After 146 years, the curtain is coming down on “The Greatest Show on Earth.” The owner of the Ringling Bros. and Barnum & Bailey Circus told The Associated Press that the show will close forever in May. The iconic American spectacle was felled by a variety of factors, company executives say. Declining attendance combined with high operating costs, along with changing public tastes and prolonged battles with animal rights groups all contributed to its demise. The company broke the news to circus employees Saturday night after shows in Orlando and Miami. Ringling Bros. has two touring circuses this season and will perform 30 shows between now and May. Major stops include Atlanta, Washington, Philadelphia, Boston and Brooklyn. The final shows will be in Providence, Rhode Island, on May 7 and in Uniondale, New York, at the Nassau County Coliseum on May 21. To be honest, it is surprising Ringling Bros. and Barnum and Bailey Circus has lasted this long. There are so many entertainment options that are cheaper or more accessible and the circus really seems to be a relic of a past time, when people were perhaps more easily entertained, or at least had longer attention spans. I gather Ringling Bros. had been in decline for some time, but the final blow seems to be the decision to end the elephant acts prompted by ongoing litigation from animal rights activists. Feld and his daughter Juliette Feld, who is the company’s chief operating officer, acknowledged another reality that led to the closing, and it was the one thing that initially drew millions to the show: the animals. Ringling has been targeted by activists who say forcing animals to perform is cruel and unnecessary. People for the Ethical Treatment of Animals, a longtime opponent of the circus, wasted no time in claiming victory. “After 36 years of PETA protests, which have awoken the world to the plight of animals in captivity, PETA heralds the end of what has been the saddest show on earth for wild animals, and asks all other animal circuses to follow suit, as this is a sign of changing times,” Ingrid Newkirk, president of People for the Ethical Treatment of Animals, wrote in a statement. I cannot see any reason why the circus couldn’t have continued their elephant acts in a humane fashion or why there could not be some compromise made in which the wild animals could perform under carefully supervised conditions, allowing audiences to have the chance to see these magnificent creatures perform. I also wonder that the animal rights activists cannot see that in many cases performing animals are cared for better than they would be in the wild where they would be subject to disease and predators. The owners of an animal act have a financial incentive to keep their animals healthy. But PETA is not interested in compromise, the jobs lost, the missing chance for future generations to see the show, or even really about the welfare of the animals. They have their own agenda and are not about to let any such considerations to get in the way. Thanks a lot PETA. 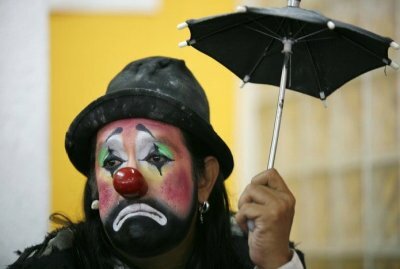 You made the clowns sad. It seems to me that more and more in American politics and culture, people are less interested in any sort of compromise and more interested in forcing their viewpoints and demands on others. No one seems willing to meet the other side halfway and compromise is seen as giving in to the enemy or a tactic to weaken the opponent’s resolve. Maybe this is the result of a growing tendency towards Manichean thinking in our discourse. Differences in opinions are not simply a reflection of different values and experiences between people of good will but as part of a cosmic battle between light and darkness. If you are on the side of the angels, than it stands to reason that your opponents must be on the side of the devils. If your candidate is a lightworker than anyone who opposes him must be on the side of darkness and his candidate must be Hitler. Naturally one does not compromise when fighting the Devil. One can only oppose him. In the meantime, if you want to see the Ringling Bros. Barnum and Bailey Circus, you had better get the tickets right now.